Hiding in “plain sight” in the middle of Korea Town is a wonderful new Japanese restaurant called Japas. If you think that the names rhymes with tapas, then you are on the right track. Japas is billed as a Japanese Tapas and Oyster Bar. The story behind Japas is very unique. 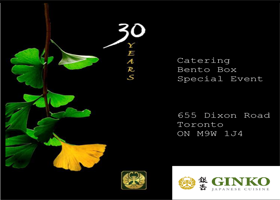 The owners Kim Chou and Chris Xu have over 20 years combined experience working as chefs at Yamato, one of Toronto’s finest Japanese restaurants. They honed their collective skills under the strict tutelage of demanding Japanese chefs, where quality ingredients were a priority and no short cuts were taken with authentic recipes. Both Kim and Chris both married Japanese women who they met while working at the restaurant. Both had come directly from Japan and were working as waitresses. Chris married Keiko Yamaji and Kim married Miwa Ikeguchi. Both women knew a thing or two about Japanese food, but Miwa had a very strong background in the food industry. Miwa’s father ran a fish business in Japan and her mother is the proprietor of a well know local Izakaya restaurant in Kyoto that she has run for over 30 years. Serving great food therefore is in Miwa’s DNA. Several of Miwa’s mother’s authentic and time-tested recipes have made their way onto the Japas menu. Miwa was able to help structure the vision of Japas, which would be based on great Japanese food and attentive Japanese style friendly service. From start to finish there are tempting dishes that will delight your taste buds and are friendly to your pocketbook. In some cases I had to check twice because the prices seemed so low. One of my favourite appetizers on the menu was Hiyayakko 3 ways for only $6.00. Japas sources a unique artisan Japanese style tofu that almost melts in your mouth. It is topped with homemade sesame miso sauce, seaweed sauce and a wonderful citrus ponzu sauce. It is a refreshing way to set up your palate for many of the other unique items on the menu. Another great item on the Tapas Hot menu is the Mussel Sakamushi. Beautiful fresh PEI mussels are steamed to perfection in a delicious sake laden broth that has to be eaten to the last drop. There is almost a pound of mussels in the dish and at $7.00 it is nothing short of a culinary bargain. What makes Japas so unique is their ability to take authentic Japanese recipes and add their own unique twist. Age Dofu comes to life when vegetables are added to the tofu before it is lightly fried and then lightly sauced in a plum wine reduction. Many of the fresh ingredients are sourced locally, but special harder to get items are imported from Japan. Large Wild Jumbo Shrimp Tempura are served with green tea salt or a homemade wasabi mayo that has you licking your fingers when your fellow guests are not looking. Fish tacos are all the rage these days and Japas’ version delivers three generous tacos that are picture perfect. One could easily make a light meal from the generous portions. At only $8.00 you might want to keep an order all to yourself. At Japas, mackerel, the poor cousin of fish, is elevated to a taste sensation in their Aburi Saba Sushi when it is marinated in salt and vinegar and then blow torched to add a wonderful smoky flavour. At Japas, most of the items are under $10.00, but the portions are so generous that they can easily be shared. With a group of friends you can cover a wide range of offerings from BBQ Tongue Spring rolls to an ever-changing Sushi Tasting Plate that always has some great surprises. As the name of the restaurant points out, Japas is a great place to dive into an incredibly fresh assortment of oysters from the U.S. and Canadian East & West Coasts. Thank goodness for the miracle of the cold chain supply routes! 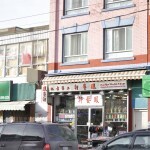 Chef Kim also has extensive knowledge regarding oysters as he once owned a seafood shop. When the chance came to open Japas he made sure his favourite bi-valves were front and centre on the menu. The assortment changes from week to week, depending on what species are available at any given time. On my recent visit there were 10 varieties available including Royal Miyagi from British Columbia, Kumamoto from the USA, Malpeque & Luck Lime from PEI. Japas was also featuring a dozen delicious French Kiss oysters from New Brunswick for $20.00. That’s the price that many seafood restaurants charge for ½ dozen. 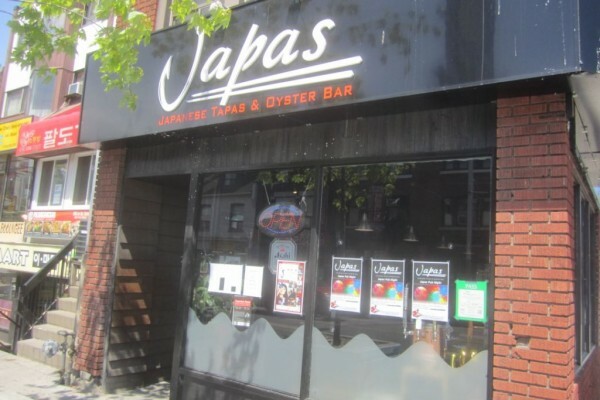 If you have a craving for oysters on a Monday or Tuesday every week, Japas is the place to go. They charge the incredible price of $1.00 an oyster on those two days! If you can track down Chef Chris or Chef Kim at Japas they will be able to explain to you all of the subtle differences between the wide variety of oysters they offer up every week. These guys know their oysters! 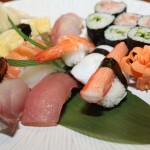 Japas has developed a loyal and very eclectic following since it opened seven months ago. On my most recent visit Japas was populated by a Japanese-speaking family with young children, a very cool looking Queen West couple who looked like local artists and several groups of Japanese kids who were getting together for some quick food and drinks. The vibe was very much like being in Osaka at a local restaurant. In simple terms, great food at reasonable prices always has a way of attracting a crowd. 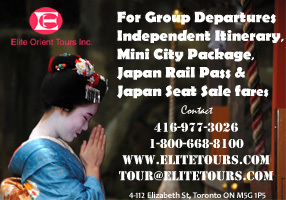 When it’s time to fill your desires for some great Japanese comfort food at great prices take the trip to 692 Bloor Street (at Clinton St.) to check out Japas Japanese Tapas and Oyster Bar.